Astroflame Intumescent Pipe Collars - 'E' Type - 2 Hour Rated. For use on UPVC, ABS, MDPE, HDPE & PP pipes. Up to 2 hours fire resistance. Surface mounted, cast or semi-cast applications. 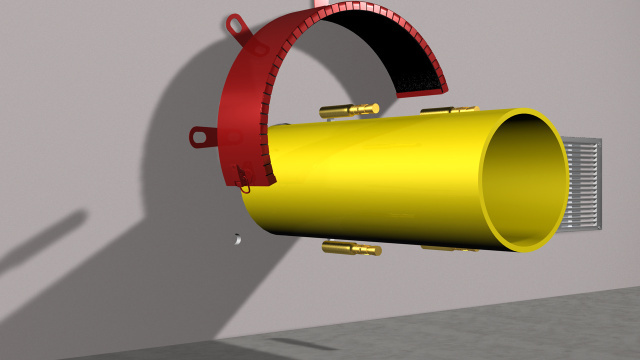 The Astroflame Pipe Collar range is available in standard sizes, to suit 55, 110, 125 & 355 mm diameter pipes, and includes intermediate and larger sizes. 120 min. rating | Red | for 55mm pipe | BS476: Part 20: 1987 and EN1366-3. 120 min. rating | Red | for 110mm pipe | BS476: Part 20: 1987 and EN1366-3. 120 min. rating | Red | for 125mm pipe | BS476: Part 20: 1987 and EN1366-3. 120 min. rating | Red | for 355mm pipe | BS476: Part 20: 1987 and EN1366-3.